A movie, a real movie! Yesterday Aidan and I took Elspeth to the cinema for the very first time! 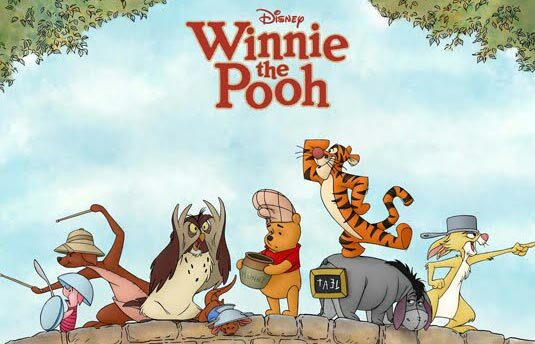 The new Winnie the Pooh movie is out, and given her obsession we thought she might like it. It was fantastic. The creators have done very well in keeping the feel and spirit of the old Winnie the Pooh, with a brand new story. Even the animation style and quality looks oldschool, in the best possible way. I’m not sure who ended up loving it more: Elspeth or her parents! It’s not a long movie, only just over an hour, so even at two years old she had no problem sitting still and watching the whole thing quietly. Except for her contortions to reach the popcorn! I have mentioned Elspeth’s obsession with Winnie the Pooh before. And the chance has just cropped up to prove my point. 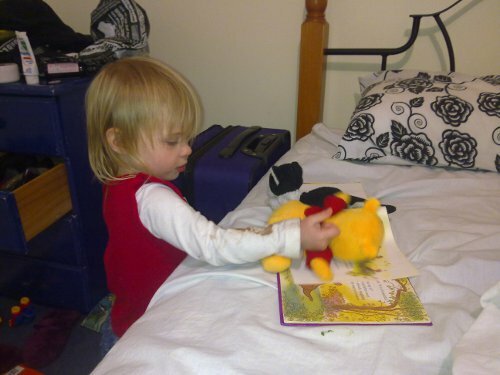 She is shown here ‘reading’ a Pooh Bear book to her Pooh Bear toy.